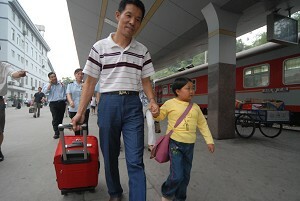 “Little Person” Li Chun'e from Zhijiang Town of Yichang City, Hubei Province got on the train bound for Beijing to enroll in the University on September 10, 2007. The 19-year-old girl is only three feet seven inches (1.1m) tall. She was accepted by Beijing University of Aeronautics and Astronautics for her high marks on this year's university entrance exam.